Quick-drying, high-build, colorless nitrocellulose resin primer. Click on the grey button "learn more" to get tips and hints for the application. Before varnishing wooden construction kits, it is recommended that you pre-treat all wooden parts, including the visible ends, with a quick-sanding primer. This should prevent the following coat of varnish from penetrating too deeply into the open pores of the wood fibres (front wood) and the furniture from being coloured unevenly as a result. 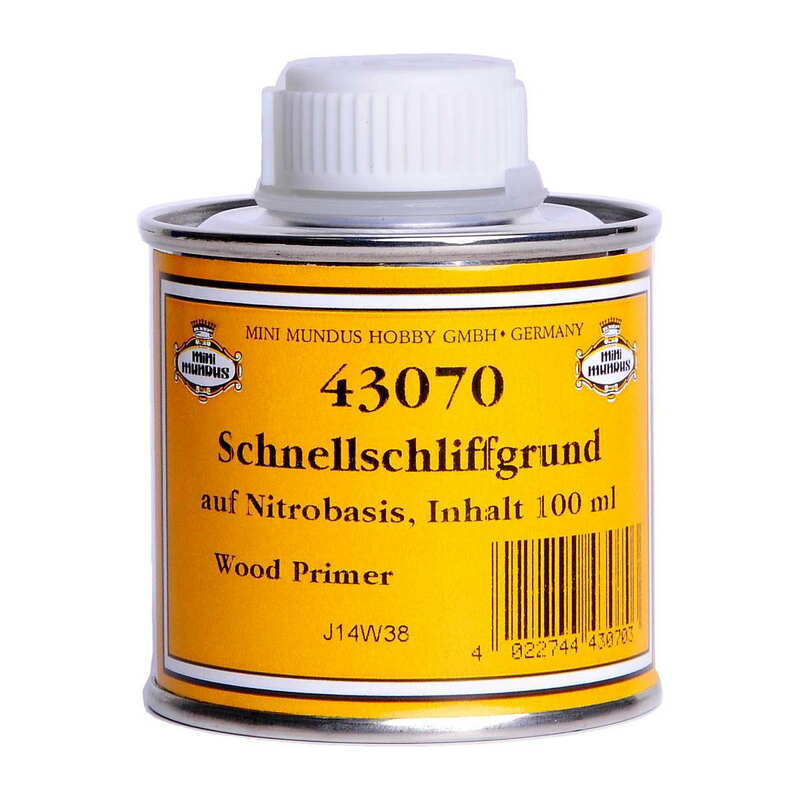 When selecting the varnish, make sure that it is also based on nitro (thinner). Before applying paint, it is advisable to apply a thin layer of the Rapid Sanding Primer to all visible cut edges (front wood edges) using a narrow brush. This should prevent the coloured liquid wax or varnish from penetrating too deeply into the open pores of the wood fibres (front wood) and colouring them too dark. Please note that the quick sanding primer does not reach other surfaces, otherwise light stains would appear after the application of liquid wax or glaze varnish. If this is accidentally done, the surface to be sanded must be wiped off immediately with a cloth (possibly soaked with a little turpentine).